Iceland come to the Aviva Stadium tonight to face an Ireland side that will be without a host of frontline players including Glenn Whelan, John O'Shea, Jon Walters, James McCarthy and captain Seamus Coleman. Coleman will be sidelined for a considerable length of time after fracturing both his tibia and fibula during Friday's game against Wales, whilst the other four players have all been allowed to travel back to their respective clubs, meaning that Ireland manager Martin O'Neill must now make at least four changes from the side that drew with Wales last week. With so many absentees, and a host of first-team regulars reportedly set to be rested, O'Neill has the chance to finally blood in some new players into the starting XI with the uncapped Conor Hourihane, Daryl Horgan and Andy Boyle all set to feature on Tuesday night. A host of new players will make their Ireland debut this this evening and here's where you can watch them and everything else you need to know about tonight's game. Ireland enter tonight's game on the back of a bruising encounter with Wales in a game that produced more casualties, and much more bookings, than legitimate goalscoring chances. The fallout from that match has largely overshadowed what looks to be a rather enticing friendly with Iceland as Ireland welcome last summer's Euro 2016 quarter-finalists to Dublin. Ireland are unbeaten in their last six matches, with four wins and two draws, and they welcome an Iceland team who have had a mixed run of form since the Euros, with Iceland winning just three of their last six, with losses to Chile, Mexico and Croatia during that period. 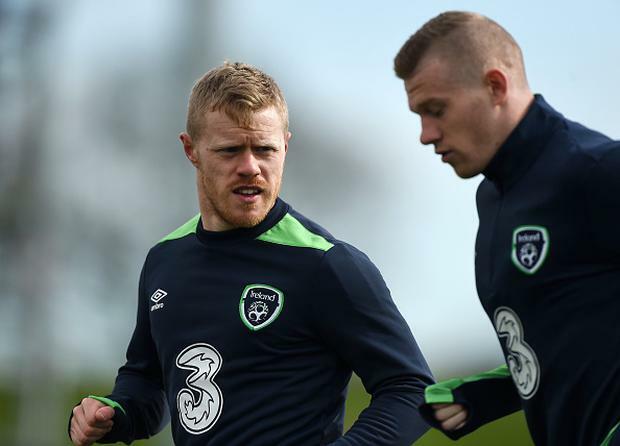 Daryl Horgan: After impressing mightily with Dundalk last season, and after making a successful transition to Preston North End this term, Horgan should finally make his Ireland debut tonight after being named in O'Neill's last two squads. The wily winger has genuine pace and creativity, and he should be an exciting addition to what will be a largely inexperienced Irish side. The game will be broadcast live on Eir Sport 2 with coverage starting at 7.00pm. For those readers who aren't watching the game live you can, of course, follow our live blog on Independent.ie. Ireland are 6/5 favourites for the tie while Iceland are priced at 13/5. Odds for a draw are 11/5. Iceland 4-2 Ireland, World Cup 1998 qualifier, September 1999. Ireland 0–0 Iceland, World Cup 1998 qualifier, November 1996. Iceland 1-2 Ireland, Iceland Triangular Tournament, May 1986. Ireland are in the midst of an ever-growing injury crisis but should have enough to beat Iceland, who will be without midfielder Gylfi Sigurdsson along with a host of first-team regulars. Ireland 1-0.